This corner was the site of the First State Bank for over fifty years. First State Bank, managed by John S. Parks, the second bank in Las Vegas but, by far, the more successful one. The first one, Las Vegas Bank and Trust Company, was located over in the McWilliams townsite until it moved over to the Clark townsite shortly after the land auction in 1905. It closed its doors later that summer with no loss to depositors. The First State Bank was originally in Kuhn's Mercantile Store across from the depot on Main Street. Kuhn's carried everything from supplies to sandwiches and lemonade. John Parks realized early on that the bank needed its own location. A wooden structure was built on the eastern corner of First and Fremont, across from the Las Vegas Pharmacy. Parks also realized that a bank should not only be secure but look secure and promote a feeling of stability for its customers. In 1906, a large, sturdy looking, brick building replaced the wooden structure and First State Bank remained a presence on Fremont Street until the mid-1950s. Pictures from those early days show a large bank lobby with elaborate teller windows, a marble floor and floral displays. According to reports of the day, the walls were built of hollow concrete bricks. The old wooden structure was sold and moved to another location. "You can save if you will only try" was the bank's motto in 1911 and they paid 4% on time deposits. Early tellers included Cyril Wengert whose home on East Charleston is now the Nevada Bar building. In the mid-1950s, the First State Bank building was demolished and the bank relocated. The Birdcage Casino was built in its place. The Birdcage only lasted on Fremont Street a few years before being annexed by its next door neighbor, The Mint. The Mint is truly one of the casinos on Fremont Street that people still miss. Built in 1957 with a tall, pink and white pylon sign designed by Yesco's Kermit Wayne and Hermon Boernge, it was an eye-catcher. The white stripe of lights that raced across the front of the sign and then upward to the heavens to light the starburst at the top made the Mint one of the most photographed icons on Fremont Street. According to Alan Hess, the Yesco designers worked with the architects, Zick and Sharp, on the design of the Mint. The sign was one of the first to exploit the three dimensional sweep of neon on Fremont Street. Under the sign, petrified wood veneered the walls. In 1959, the Mint annexed the Birdcage and in its place had the original architects and neon designers design a corner facade that would go with the original building. The arching eyebrow with its white chaser lights quickly became a landmark on Fremont Street masterfully uniting the two buildings. The Mint had a lounge where my folks saw Johnny Cash perform in the early 1960s for the cover charge of two drinks. They each had two beers. The total $1.00. They say Cash put on a heck of a good show and they became life long fans. In 1961, developer Del Webb bought the hotel from Milton Prell. In 1965, a 26 story tower was added. The Mint also had a beauty salon for its female guests. The Top o' the Mint, a lounge with a view over-looking Downtown and, back then you could see all the way to the Strip, was a favorite romantic spot for tourists as well as locals. In the mid-1960s, the Mint sponsored the Mint 400 race that started, fittingly enough, in front of the hotel. The final race was held twenty years later. In Fear and Loathing in Las Vegas, the late Hunter S. Thompson wrote about spending the night at the Mint and Lee Marvin and Woody Strode shot at Vegas Vic one night from their hotel rooms. Along with the 1950s facade of their next door neighbor, the Horseshoe, the two hotels made a "solid block of superb 1950s popular Modernism" says Alan Hess and helped Fremont Street become Glitter Gulch. In the late-1980s, the Binion family bought the Mint and expanded the Horseshoe to the corner covering over all that iconic signage. In the middle of the block was Cornell's Family Shoe Store, the original location of Smith and Chandlers Western Wear as well as the original location of Ronzoni's. 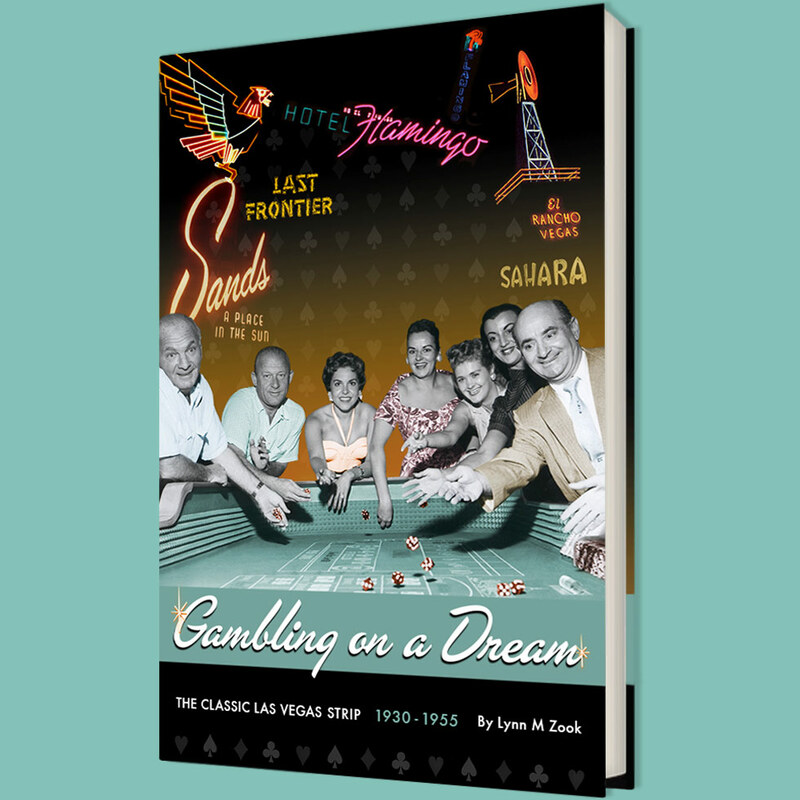 In the late 1940s, both Smith and Chandlers and Ronzoni's moved further east on Fremont Street to make room for the Savoy Club. Next door was the Boulder Club one of the original gambling halls on Fremont Street and the first to have a neon sign designed, of course, by Yesco. In fact, the signage for the Boulder Club was the first neon sign that Yesco designed and installed in Las Vegas. The Boulder Club, owned by local businessman Pros J. Goumond, opened in 1929. It was a sawdust joint "a working man's hang-out" said local attorney Paul Ralli. The original facade of the Boulder Club, like the Las Vegas Clubacross the street, was simple, Moderne with a hint of chrome. "The glint of chrome emphasized the appealing modern air-conditioning inside" says Alan Hess. Air conditioning came to Las Vegas in the late 1930s and changed the way people lived and played in Las Vegas. The original Boulder Club signage, designed in 1933 by Yesco was a large vertical sign with a modified zigzag modern crest no more than ten feet above the roofline. The sign had the name in neon letters. After Boulder (Hoover) Dam was dedicated in 1936, the Boulder Club had a new sign designed that included a neon recreation of the Dam's face. It was much bigger than the original, going almost agood story above the roofline and included a marquee neon front. The Boulder Club offered 10 craps, faro and other games of chance. In 1946, while stationed in Tonopah, Nebraskan Jackie Gaughan, whose family had gaming interests in Omaha, bought a 3% interest in the Boulder Club thinking he might return to Las Vegas some day. Other partners were Farmer Page and Tudor Scherer. In 1960, the Boulder Club caught fire and burned. The casino never reopened and the Binion family bought the building and expaned the Horseshoe Club. Next door to the Boulder Club was The Jackpot. The Jackpot was famous for its sign Home of the 1/2 lb Deli Sandwich. When the Binion family annexed the Boulder Club, the Jackpot was annexed as well. Special thanks to Alan Hess, Allen Sandquist, Special Collections, Nevada State Museum and KimosVegas for the photos and postcards. Due to the length of this page, I am going to continue the history of this block on the next page.